What is the Payroll Code used for on Department Codes? The Payroll Code is used for some of our Integration exports. 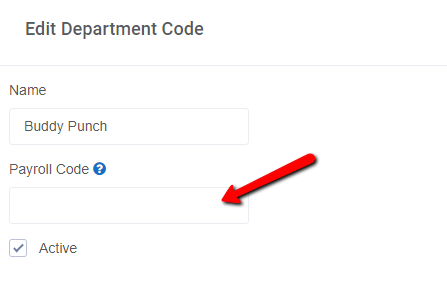 When created and editing a Department you will see a "Payroll Code." This code is currently used for our ADP Workforce NOW export. If an employee has any time in a Department Code that has a Payroll Code, this will be added to the Department Column of the ADP export. Currently this is not used for any other integration partners.